The peoples of Kenya website is a gallery of paintings by Joy Adamson depicting the indigenous tribes of Kenya. Many of the originals of these paintings are now on display at the National Museum of Kenya. High quality prints over forty of them are also available for purchase from this site. Joy Adamson started painting Kenya's wild flowers shortly after she arrived in Kenya, whilst travelling around the country with her second husband, Peter Bally. 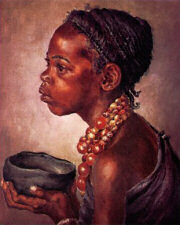 In 1945 she began painting the tribesmen and women of Kenya for her own pleasure. This was by way of an experiment as she had never painted portraits before. Subsequently, she was commissioned by the British government to paint a record of the twenty-two most important tribes of Kenya. She completed one hundred and thirty-two portraits over the following twelve to eighteen months. After the commission, she continued to paint the peoples of Kenya wearing their colourful costumes and jewellery, completing a total of over seven hundred portraits during the following few years. Images of fifty-four of these paintings are shown in the gallery on this site, depicting members of the Arab, Bajun, Balessa Kulal, Boni, Boran, Dabida-Teita East-Suk, El Barta, Gabbra, Giriama, Idakho, Imenti, Isukha, Kadam, Kasigau, Kerio, Kerio Turkana, Kikuyu, Kisa, Kuria, Lake Turkana, Lamu, Luo, Maasai, Marsabit, Nandi, Njemps, Pokomo, Rendille, Samburu, Shirazi, Somali, Suk, Sukuye Boran, Taveta, Tugen and Turkana peoples. Prints of most of these images are available for purchase. The gallery shows which ones are no longer available, or are running low in stock. Please click here or on the portrait to enter the gallery. Joy Adamson was a painter and naturalist who lived most of her life in Kenya. She is perhaps best known for her relationship with Elsa the lioness. In 1956, Joy's husband George, who was working as a game warden in Northern Kenya, was charged by a lioness and was compelled to shoot and kill her. Shortly afterwards he discovered that she had been protecting her three cubs, which he and Joy then adopted. Three growing lions proved to be too much of a handful, so eventually the two larger cubs were sent to a zoo in Rotterdam. The smallest, Elsa, remained in Africa with the Adamsons where she was raised by them, eventually being released into the wild. Elsa's story, and that of her three cubs, is told in three books written by Joy. Born Free deals with Elsa's early life with the Adamsons, Living Free covers her adult life and the birth of her three cubs and Forever Free tells of the lives of those cubs. 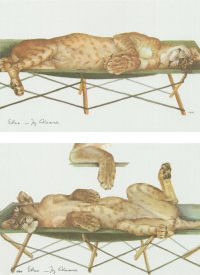 Two of Joy's sketches of Elsa lying on a camp bed are available as prints from this site. Please click here or on the images of Elsa for more details. .